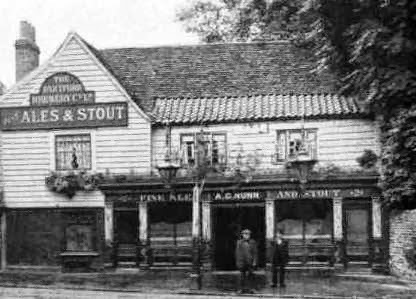 This is the White Hart on a summer’s day in 1909, and it was going to be the subject of the story. Mrs Ann Nunn who ran the five roomed pub was 59 years old had been born in Suffolk and was a widow. During the twenty or so years before 1909 she had run another pub on King Arthur Street a few minutes’ walk from New Cross Road. Back then it was a densely packed part of south east London close to an iron works and in the shadow of the viaduct of the London, Brighton and South Coast Railway. Now I don’t yet know when her husband died but I think it may have been in 1897. Either way she was still in King Arthur Street in 1901 and will have moved into the White Hart sometime aftter the January of 1908 and had gone by 1918. Now I know this because she does not show up on either the street directories for 1908 and 1918 but is there on the sign above the door of the pub in 1909 and fills in her census return two years later. 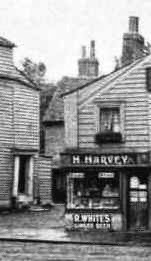 But as things do I was drawn away from Mrs Nunn and instead wandered a little further up the street, stopping first at Harry Harvey’s fruit and greengrocer’s shop next door. It is one of those remarkable examples of just how many people can be squeezed into a small property. Here in the two rooms above the shop lived Mr and Mrs Harvey their two young children and the 18 years old assistant Frederick Walter Saunders. Nor were the Harvey’s the only family to juggle overcrowded conditions, for around the corner in another two properties with just two rooms each lived the Chapman family of four and Mrs Hunt and her three children. And it is Elizabeth Jane Hunt’s story that draws you in. Her three children were aged, 10, 8 and 6, and for her the juggling began with having to have her daughter in her bedroom leaving the two boys to share the downstairs room beside the scullery. She had been married for eleven years and worked a charwoman, which was not an easy job. The date of her husband’s death has eluded me so far but I know he was called Charles and worked as a “Steel and Grass Borer in the Gas Works", and in the April of 1901 Elizabeth and Charles were living on the Broadway in Bexleyheath not far from Gravel Hill. There is a record of a Charles Hunt who died in 1907 which puts their youngest child at just two years old. His death may have occasioned the move to 4A the High Street and those two rooms hard by the White Hart. I don’t have a picture of the properties but they look to have been built with one room above the other and a lean to scullery or kitchen attached. Alternatively they may have been part of number 4 which was the shop run by the Harvey's/ If so this makes that property a much larger one with six rooms which will have been subdivided. 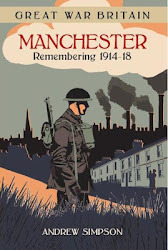 Either way neither Elizabeth Jane or Mr amd Mrs Chapman appear on those street directories which either means the rooms were vacant or that they were not deemed important enough to be listed at number 4. I am hoping that someone will have a picture, but in the meantime I am forced back to that of the White Hart.